Strawberries and cream: the first sign of Summer. The days are getting longer, you've got a bottle of Pimms at the ready and you just about dare to bare your legs. With Wimbledon kicking off this week, no doubt they'll be lots of strawberries and cream inspired recipes being rustled up. I've kept it classic with cupcakes, made with vanilla sponge and topped with a light crème fraîche cream topping. To celebrate National Recycling Week, Central England Co-op are encouraging people to "Taste It - Don't Waste It" in their latest campaign. I discovered some fantastic leftover recipes over on the Love Food Hate Waste site, perfect for inspiring you to turn those extra ingredients into something rather fancy. Using leftover potatoes, I went for homemade gnocchi, which can be added to leftover bacon (when that exists...), double cream and frozen peas to create a gnocchi carbonara. I do love me a hearty meal packed with vegetables, even better - what I like to call secret veg! Sometime last year, I sampled a delicious jackfruit burger at The Orange Tree in Leicester. The green jackfruit, found in most Asian supermarkets has a fleshy almost "pulled" appearance which gives it a very realistic pulled pork texture. It also has next to no flavour, making it perfect for adapting to whatever vegetarian recipe takes your fancy. Strada has become known for a modern approach to Italian dining, with well known dishes and unusual ingredients alike. They pride themselves on fresh pasta, authentic Italian ingredients and knowledgable staff. Having just launched their Summer set menu at The Mailbox venue in Birmingham, I went along with my mum to sample their offerings. With more and more well known dishes turning to healthier and gluten free alternatives, there are so many fantastic courgette, sweet potato and cauliflower recipes out there. Switching out heavy carby ingredients for veg is a great; not only do you get your five a day and don't have quite so much of that horrible full feeling, it means you can add more cheeeeeese to the top. By no means did I invent the original cauliflower pizza recipe, but this is one I've practiced and tweaked to suit my tastes. A magical place where the likes of Wispa, Flake Crunchie, Creme Eggs and the infamous Dairy Milk are made. Founded in 1824, Cadbury are best known for their deliciously milky chocolate and bright purple branding. For years, school kids and big kids alike have travelled to the Bournville based factory to learn how chocolate is made, explore choccy related games and of course... have a few cheeky samples themselves. But now, you can also enjoy afternoon tea at Cadbury World too! As one of my favourite pastimes, I naturally jumped at the chance to try their chocolate afternoon tea. Fresh, quality, always. With more of us mindful of getting that all important 5-a-day, it’s fantastic news that the Co-op are pledging to cut their prices on fresh produce. The key is to provide fresh fruit and vegetables daily, that are both fab quality and at a much more competitive price. earl grey and lemon loaf: cake swap with xameliax. Hey guys! I'm Amelia from the lifestyle and food blog xameliax.com and YouTube channel xameliax! I love in the middle of England and have an insatiable passion for food and drink, cooking and baking my way through my own kitchen and eating out at a myriad of restaurants across the country. I love mixing new and exciting cocktails and tasting fab wine and I review all sorts of eateries from purse friendly pub grub to Michelin star establishments. Like Emily I love a big mug of Earl Grey tea (although I take mine black with a slice of lemon!) and as i've always wanted to give tea loaf a go I thought this would be a brilliant opportunity to get creative! This cake is perfect for whipping up if you have guest coming round for a quick cuppa and will keep in a tin for up to a week or even in your freezer for up to three months so you always have some homemade cake to put out when mum pops round unannounced! Cheese and wine; one of the best foodie combinations there is. Am I right? I was recently sent a Simply Sublime hamper from Serenata to nibble, scoff, dip and slurp my way through. The perfect posh grub for a night in with a good film and company. Here's your chance to win a cheese and wine hamper - plus lovely wicker willow hamper - for your own foodie night in. I have recently discovered the joy of overnight oats! Yippee! Let's just put it out there, I'm not a morning person. So if there's a quick and healthy breakfast recipe that lets me press that snooze button just one more time then I'm in. What's more, I love my almond, coconut and hazelnut milk so all these easy overnight oats recipe suggestions are dairy free and vegan friendly. Just a stone's throw from the glorious Jubilee Gardens, you'll find Bath based brasserie Allium. After a short stroll through the luscious greenery and historical spa town, it was lovely to sit down to a light lunch in the airy and artfully decorated restaurant. With rich terracotta walls, Allium, which is part of the Abbey Hotel, has carefully selected art adorning the walls, as well as fresh plant life, crisp white tables and high ceilings. We sat with a great view of the contemporary artwork and slowly bustling lunch crowd. The tables are lovely and large and we had an unusual hanging plant dancing next to our chairs. 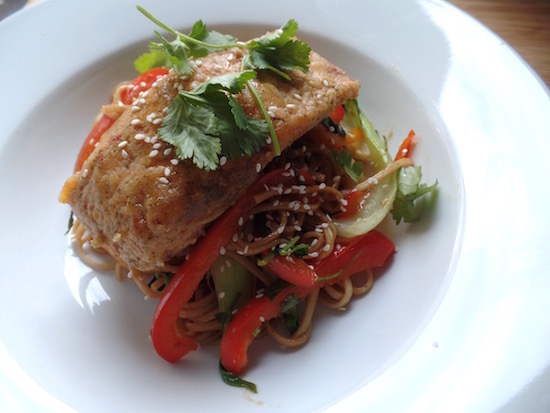 switch the fish: sesame seared japanese loch trout. If you're a regular here on my little blog, you'll know that I do love my seafood. Salmon sashimi, king prawn tempura and light and crispy calamari to name a few favourites. Even though I'm open to all fish varieties, and love using sustainable coley, pollack and river cobbler in place of white fish, it isn't often enough that I create recipes with lesser known fish varieties. Sainsbury's are challenging food bloggers to create recipes with alternative fish offerings - a campaign aiming to broaden the choice of fish we all eat. If customers asks for one of the "big five fish" that make up 80% of the fish sales in the UK (salmon, tuna, haddock, cod or prawns) they will be offered a portion of either sea bass, coley or hake for free. I went for loch trout and decided to put my favourite spin on a recipe - Japanese. Inspired by the fragrant flavours of Japan, this recipe features a zingy soy and sesame marinade, steamed veg, sticky sushi rice and lots of sesame seeds to create a donburi style rice bowl with seared sesame trout laid on top. My dad is a bloke of simple pleasures. Give him a Bird's pork pie or a pot of their famous pâté and he'll be a happy man. For those who aren't lucky enough to live into the East Midlands, Bird's is a family founded Derby bakery which opened in 1919 and sells the best sausage rolls, cobs and caramel doughnuts that you'll ever try. By 12pm the shelves will be practically empty after being cleared out by the local carb lovers. Fact. On the other hand, my dad loves Italy and the simplicity of their way of life, cuisine and flavours. For a twist on a pork pie recipe, I wanted to create one with Italian herbs and a hint of tomato. This method is a real cheat and a super easy recipe for pork pies. In other words, not the traditional way. Being from Leicestershire I should know better, but instead I've rebelled against the county of pork pies, Stilton and Red Leicester in favour of... the Italian inspired pork pie! I'm a huge, huge seafood fan. Eating at least 4-5 portions of fish a week, I'm always looking for new flavours and recipes for salmon, trout, haddock, tuna and seabass. Mostly I tend to eat salmon, for which I'll buy a whole side, slice up into portions and pop in the freezer. With ice as nature's preservative, I'd like to think this is the most purse and eco friendly way to enjoy fish without wasting food or money. Enter: Big Fish Brand. With heritage dating back almost 100 years ago in the seaside town of Grimsby, I was delighted when I was invited to review their latest products and flavours. afternoon tea at fortnum & mason, piccadilly, london. Fortnum & Mason truly does exquisite afternoon tea. Think fluffy sandwiches, delicate patisseries and a plethora of tea blends to choose from. There's no doubt this will be a positive review, but couldn't wait to share this fantastic afternoon tea in London's famous F&M at 181. Piccadilly.